Urban Initiatives – Thank You to Our Associate Board! Thank You to Our Associate Board! Urban Initiatives is kicking off our week of thanks by highlighting one of the most influential groups on the UI team- the Associate Board. 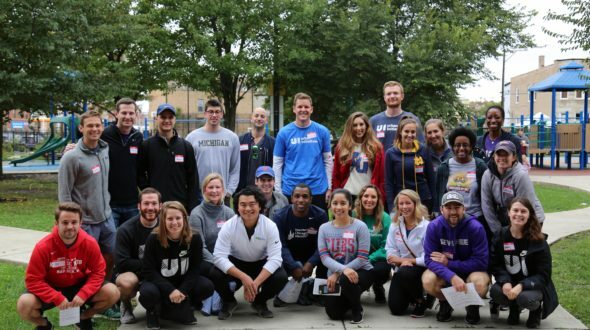 The Urban Initiatives Associate Board is a group of approximately 150 young professionals who dedicate their time to volunteering with UI participants, helping to plan UI events, and raising funds to support our work. Our members come from all over the greater Chicago area to support the kids and families that we serve. Although their backgrounds and careers are vastly different, all of the Associate Board shares a common goal to serve Chicago’s youth and empower our next generation of leaders. In our last fiscal year, the Associate Board generated over $200,000 for Urban Initiatives and volunteered a collective 600 hours over the course of the year. This incredible group is so generous with their time, talent and treasure. Let’s break down some of the ways that the Associate Board gives back to Urban Initiatives. Sebastian Bellm is an incredible UI volunteer and mentor. He is consistent, kind, and always willing to go above and beyond for UI’s participants. 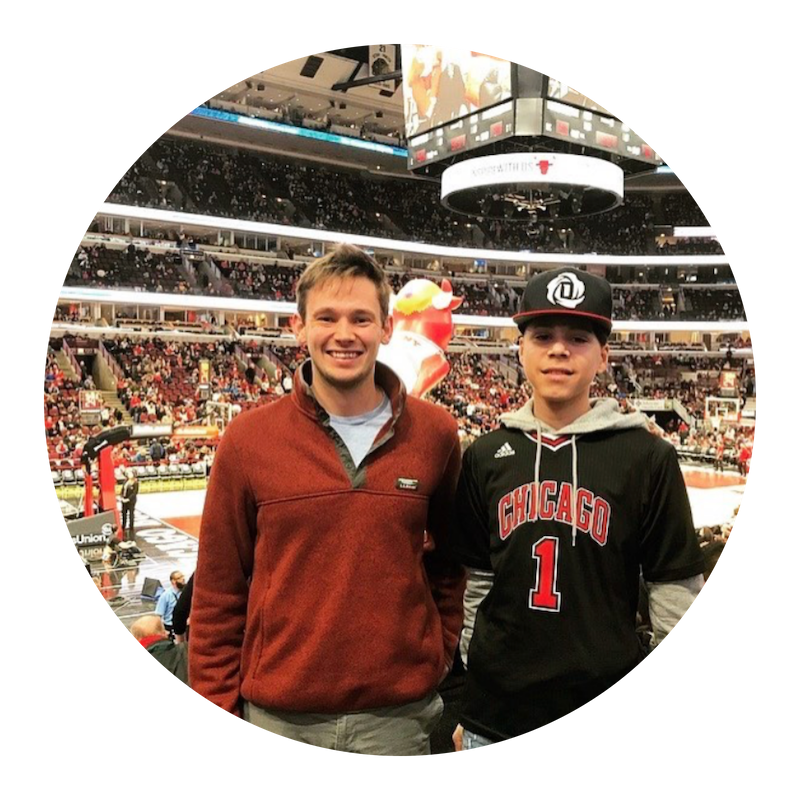 One of Sebastian’s best qualities as a volunteer is his willingness to provide one on one attention to our participants, level with them, and ensure that every student feels included in activities. One of the most impactful ways that the AB gives back to UI is through their volunteer hours. 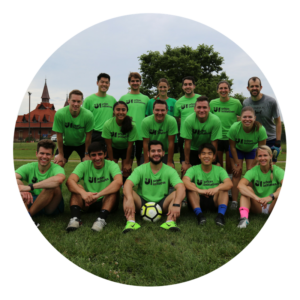 Many Associate Board members volunteer with our participants throughout the year at events like our Multicultural Cup, the Associate Board Pizza Party, and the Work to Play Cup. However, some Associate Board members have dedicated their time to less glamorous tasks. For example, they have helped us assemble registration packets during our randomized control trial that we conducted alongside The University of Chicago Urban Labs in the 2017-2018 school year. Some of our most dedicated Associate Board volunteers are our Coach for Success mentors. Our Coach for Success high school program provides participants who have grown up in UI programs the opportunity to continue with UI curriculum in order to prepare for success in college and career pathways. A critical component of the Coach for Success program is the opportunity to be paired with a mentor. Mentors provide individualized support to participants and offer guidance through the difficult decisions that come in high school. We currently have 9 Associate Board members that act as mentors. They attend monthly meetings with their mentees and check in regularly in between meetings. In addition to their work as volunteers, the Associate Board puts huge amounts of time and effort into raising funds to support UI’s programs. Through several campaigns and initiatives they were able to raise over $200,000 last school year to support our work. Associate Board member, Rachel Flanagan is a longstanding member of the Urban Initiatives team. She played on the Wilmette Wings and was coached by our Executive Director Jim Dower when she was in primary school. Now, Rachel is a Financial Services Consultant at Accenture and got Accenture to sponsor a team in Urban Initiatives’ 2018 Corporate Challenge Cup! One of the primary ways that Associate Board members fundraise for UI is through our annual crowdfunding campaign- the Bus Campaign! Busing is one of UI’s largest programmatic expenses, but we believe that the opportunity to cross neighborhood lines and play with and learn from other peers, coaches, and stakeholders is one of the most valuable opportunities that UI can provide our participants. The Associate Board raises money each spring to help cover the cost of our busing so that our participants can get to game days, field trips, and retreats across Chicago. In the spring of 2018, the Bus Campaign raised $72,000! Additionally, Associate Board members can have a huge impact by getting their companies involved in UI. Some Associate Board members secure table sponsorships from their companies for our annual gala The Soccer Ball. Other Associate Board members have helped to organize industry dodgeball tournaments within their industry which raises money to support our programs. Our Associate Board members are incredibly creative fundraisers, and their efforts make a huge impact on our programs. Each Associate Board member sets their own goals and can determine the type of engagement that best fits them, but everyone is incredibly successful each year in drawing in new supporters to the UI team and providing our participants with the best possible programming. Urban Initiatives relies on Associate Board members who are critical components of so many of our events. From leading the charge on ticket sales to volunteering as referees at events, Associate Board members help our events run smoothly! 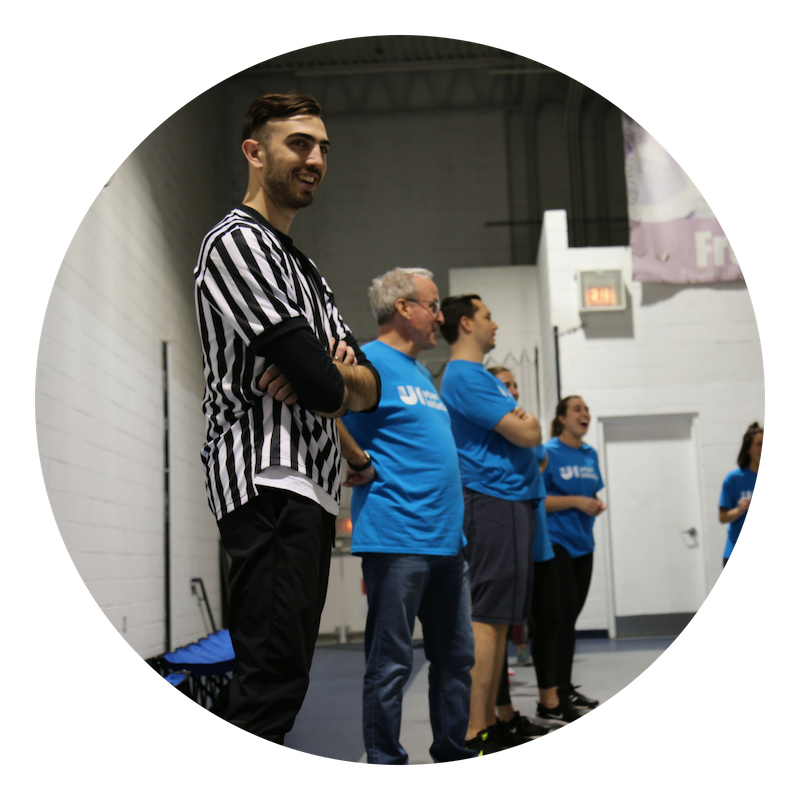 Recently Associate Board member, John Reglin, volunteered as a referee at our dodgeball tournament presented by MBRE which raised $22,000 for Urban Initiatives. John was critical in making this event a success by assisting our team in the set up, break down, and execution of this hugely impactful event! For our largest event of the year, The Soccer Ball, Associate Board members help to solicit silent auction items, they help us take photos during the event, they bring their friends to support UI, and they make generous donations during our paddle raise. During the Work to Play Cup, Associate Board volunteers are vital to providing each team coaches and fans that cheer them on throughout the day. Associate Board members help to ensure that our participants have the best day of the year during this celebratory event. Our Associate Board members impact Urban Initiatives in so many ways, but above all they provide our participants with positive adult role models. We so appreciate all the work our Associate Board does, so we want to give a special thank you to our 150 Associate Board members for caring about the students, families, and communities that we serve. Curious about the other stakeholders that drive our programs success? Follow along on our social media throughout the week as we thank the many contributors that are helping Urban Initiatives empower the next generation of Chicago’s leaders!